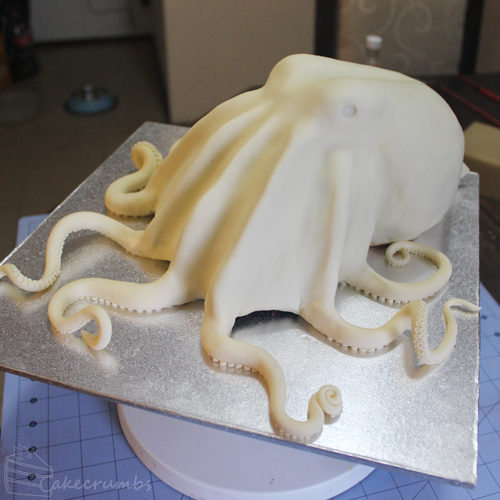 A few months ago, a friend of mine asked if she could commission me to make a cake for her birthday. I was, of course, incredibly excited to be given the task and promised to save the date. Little did I know at the time how insane November was going to be for commissions, but I was fortunate that they all fell on different weeks and I didn’t have to turn anyone down. I know this friend through Uni. We did our Zoology undergraduate degrees together, and we also started our Zoology Masters degree at the same time. When she first asked me, I had no idea what sort of cake she was going to ask for. But when she later approached me with the idea, I figured I should have known. While all of us Masters kids have a passion for every animal, great and small, we all have our groups of fauna we navigate towards. We tend to think of ourselves as being in two groups: the terrestrial and the marine halves. 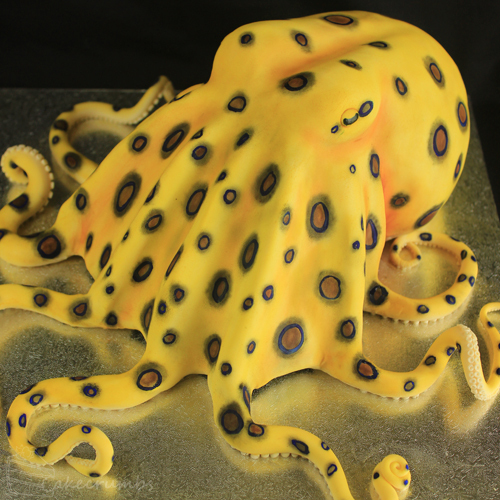 Her passion, and her research, is marine biology, so I perhaps should have guessed that her cake would be along those lines. 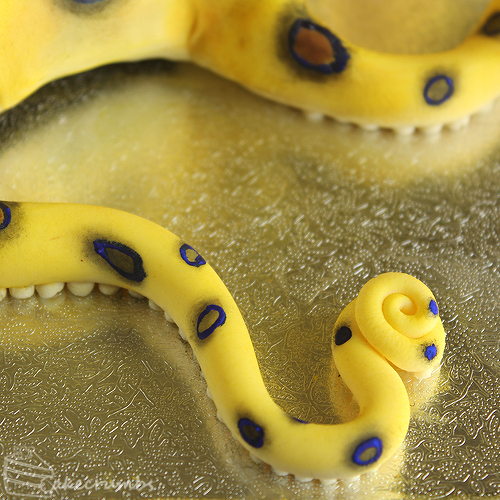 As soon as she asked me for not only an octopus, but a blue-ringed octopus cake, I was practically bouncing with excitement. Given that I was on a tram on my way home from work it probably wasn’t the most appropriate time to become hyper, but I was thrilled at the chance to try it. Once the excitement wore off, though, I had to work out how the hell I was gonna make this thing. Realism presents an exciting challenge, but it also terrifies the living daylights out of me. To the point I tend to actively avoid it in most forms of art I try. When you’re going for a stylised or cartoon version of something, you can get away with a lot. But when you’re aiming for realism, it becomes so much easier to miss the mark, and so much easier to pick out every fault. I spent a bit of time devising a battle plan. Unfortunately half my battle plan was ‘make it up as you go along’. Which is a lot more organised than usual, but still not ideal. As I stood before a massive stack of chocolate mud cake, knife in hand and ready to carve, I was still trying to decide which bits would be cake and in which order I’d be creating the various body parts. Something I was still working out as I started to carve. 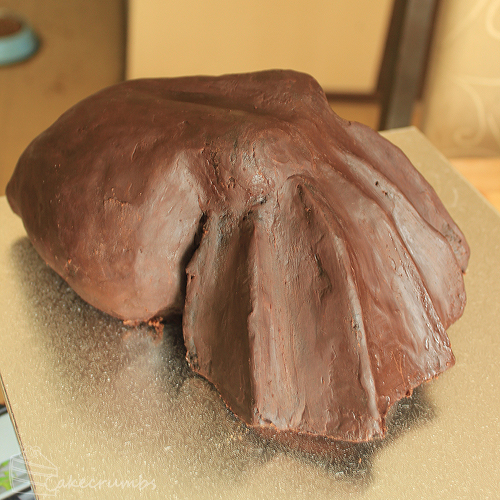 I got a rough shape for the mantle and the top half of the legs, then started covering it in ganache. At some point after this I decided I’d make the arms before covering it with fondant. I still wasn’t convinced that this was the right option, but since this was the first time I was making anything like this it was all about finding out. In the end I was glad I made it this way around. Once I’d shaped the arms, I started working on the suckers. The was the longest and most tedious part. I spent a whole day cutting out hundreds of tiny circles, indenting them and securing them into place. The worst part was knowing that you’d never see most of the detail once the arms were turned the right way up. But the effort was worth it, because it made a huge difference to the final look. 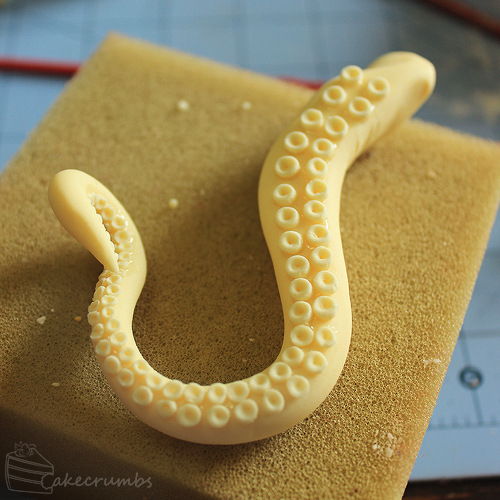 I secured the arms in place and started working on covering the rest in fondant. I left it overnight to dry, so I could work on painting the blank canvas the following day. How to paint it was another point of indecision. Often when you paint with food colouring, you usually mix it with some kind of alcohol to make a ‘paint’. The thing with doing that is that you get an effect that’s much like painting on a canvas with acrylics: you get a raised effect with the paint. It gives texture. 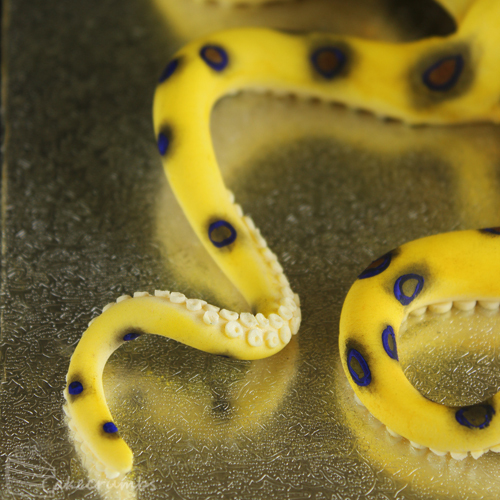 I didn’t want the skin of the octopus skin to have additional texture, so I oped to paint it with dry powdered food colouring instead. This turned what could have been done in an hour or two into a 10 hour paint job. Building up colour with powder is very slow going, but the result is worth it. Perhaps one day I’ll have to invest in an airbrush to make life easier, but for now it’s powder and patience. I started by making a yellow base coat, then added shadows and highlights. I particularly wanted to give as much depth to the skin between the arms as I could. Blue-ringed octopuses, like all cephalopods, can change their colour at will. At rest they are pale yellow to dark brown and their spots are usually brown to black. It is only when they feel threatened and have no escape that they will turn bright yellow and display those magnificent blue rings. 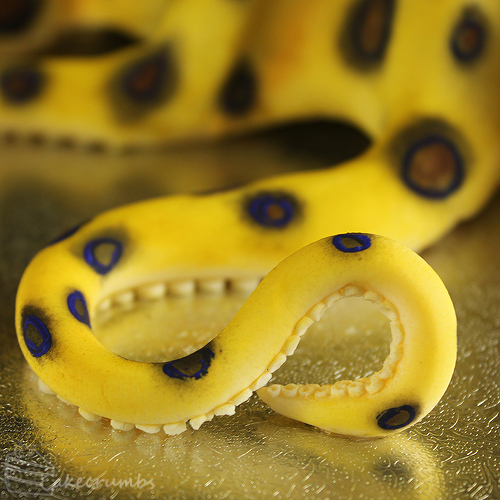 This gorgeous colour is meant as a warning, for what comes next is a venomous bite. I opted to depict it’s colours in this defensive mode, as that’s the colour it’s known for. I found the most gorgeous, vibrant blue powdered colouring for the rings that was a perfect match for the blue the octopus displays. But to paint the rings I had to mix it with alcohol. Herein I discovered that most of that vibrancy was lost. When the sun shone directly on it it looked a lot more vibrant, but I couldn’t take photos of it in direct sunlight without it becoming over-exposed. So I was pretty disappointed by how the blue rings turned out, though there are places where it looks blue enough. There are four known species of blue-ringed octopus, with a dozen or more suspected to exist. I modelled this one off of the species Australians are most familiar with: the Southern blue-ringed octopus (Hapalochlaena maculosa). 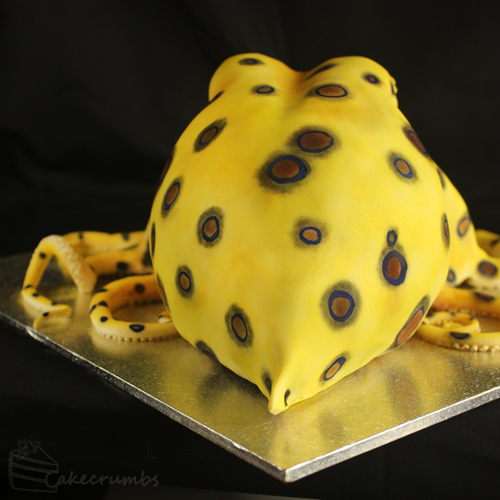 They’re often likened to be about the size of a golf ball, so this cake is some 100 times larger than a life-sized octopus. It makes for a complete reverse of what I’m used to: usually I’m trying to make smaller versions of things. Making it so much larger than life size presented a challenge. Much of what makes the southern blue-ring look as it does is how tiny it is. It was a challenge trying to keep it look dainty. And here’s where I’m going to post lots of gratuitous shots of the arms, as they took me so long I just have to share some of the detail. By the time it got towards the suckers at the ends of the arms, I was making suckers about a millimetre in width. Calling it fiddly would definitely be an understatement. All the spots on the arms look a lot more vibrant blue than the rest of the body. It might have been that when I was getting to this point the alcohol was evaporating so the dust began to dry out again, making it look a bit closer in colour to the original powder. I’m not entirely sure how I got through it without breaking them. A number of the arms have portions that are suspended in the air. None of them them were given any supports, just allowed to dry and support themselves in their positions. So painting them made me really nervous. One of the arms started developing signs of cracking when I was turning to over to attach the suckers, so I was fairly sure it wasn’t going to surviving being battered with a paint brush. But it did and I was so thankful. The birthday girl was so pleased with how it looked and tasted. I get really nervous when making cakes for people I don’t know, but when it’s for a friend you want it to be really special. So her reaction make it all worth it. Three years ago when I started my Masters degree, the department held it’s annual bake-off. On the posters to advertise it they’d used a bunch of photos of science-ey cakes from around the web. One was of them was a photo of that internet-famous octopus cake. My friends told me I should make something like that, to which I said no way. There was absolutely no way I was gonna come even close to that. 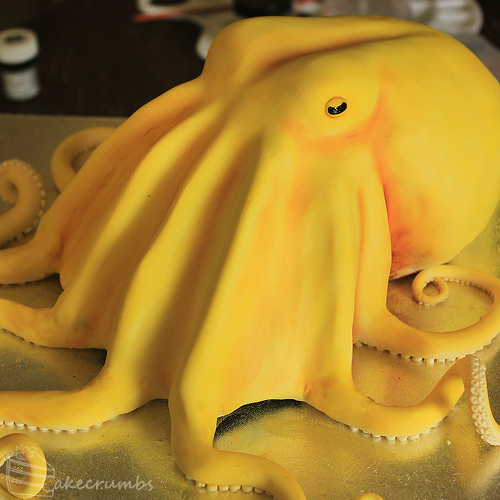 Fast-forward three years and I find myself making my first attempt at a realistic octopus cake. I still think the other one is better than mine, and I see lots of room for learning and improvement. But it’s incredibly exciting to think back on that moment of ‘no way’ and realise how far I’ve come in that time. I’m blown away! Your work is absolutely incredible and beautiful! 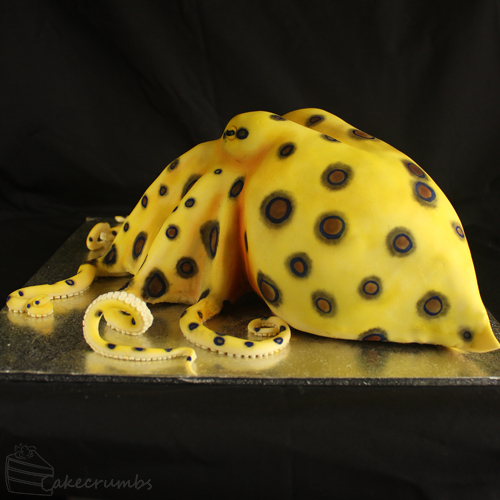 Such a beautiful cake – and I definitely appreciate the suckers on the bottom of the tentacles. I am glad you are able to see how far you’ve come in 3 years, and glad you share your work because it’s so fun to see! This cake is a beautiful work of art! It is indeed incredible & beautiful! The time & creativity that this took is absolutely amazing! Bless you for sharing these wonderful photos! it’s beautiful! I’m a huge fan of your work. I love what you’re able to produce from a (smartly-equipped!) home kitchen. very inspirational. one day, I want to attempt a black-footed ferret cake for a relative of mine, and your work makes me think that hey, at least it’s worth trying! thank you. It’s always worth a try! And anything that doesn;t go well is just a lesson for the future. Can I just say, holy s**t. I mean all your other cakes and desserts are incredible and I love all your recipes, but wow this is amazing!! Wow. I mean utterly wow! 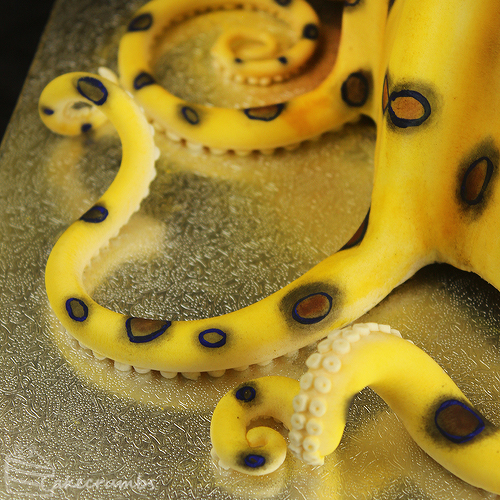 That cake is amazing and you deserve to be immensely proud of that amazing work of edible art. It would almost be a shame to cut into it, but I bet it tasted delicious! Thanks so much! My friend told me it was delicious so I have to take her word for it haha. The blue on the arms in these photos looks great. Once again I was blown away by the detail in your work. It’s great seeing your progress over the years. 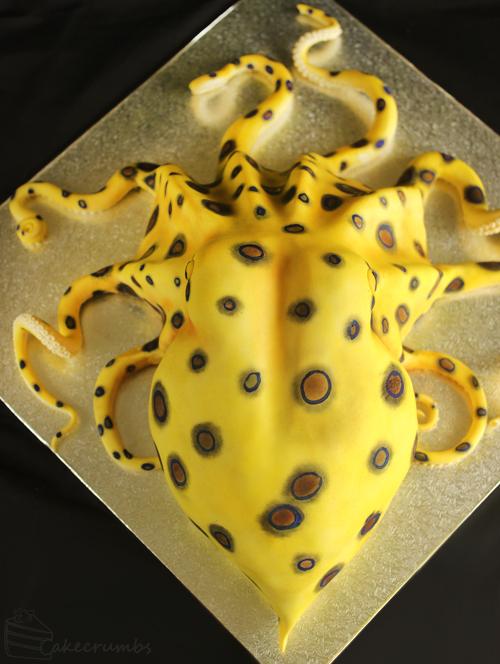 As someone with a professional interest in zoology and a personal interest in cake… I would just like to say how incredibly flippin’ awesome this is. WOW!! Amazing. I think this looks really awesome. Well done. That is an amazing and original cake. Thank you for describing your process! 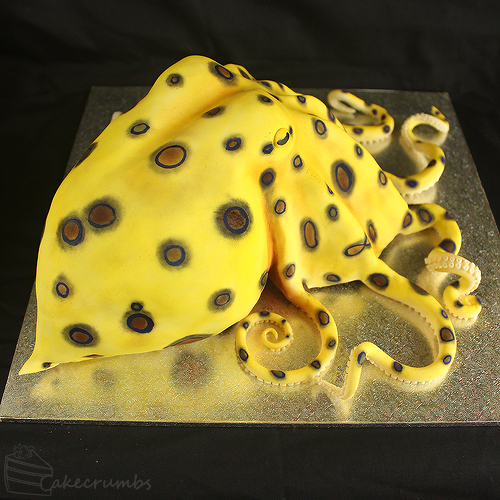 I am a hobby cake-maker and my husband loves octopuses… I kind of think no way could I make that, but inspired by your own story I may just give it a go! Thanks so much! It can be a challenge, but whatever doesn’t work out is only a lesson for next time! Wonderful cake, great text, fabulous pics! Well done!!! This cake is nothing but stunning! Excellent work! Could you share how you got the arms attached…I see no seams! Thank you! I spent a lot of time working the seams of the fondant in until you couldn’t see it any more. When it started to dry I used a little alcohol to help moisten the edges and rub it in. What little evidence was left was covered with the food dye. Thank you for your reply! My daughter’s 21st birthday is this month and she really wants a cake like this…I’m trying to decide if I’m up to the task:/ Once again, EXCELLENT job! 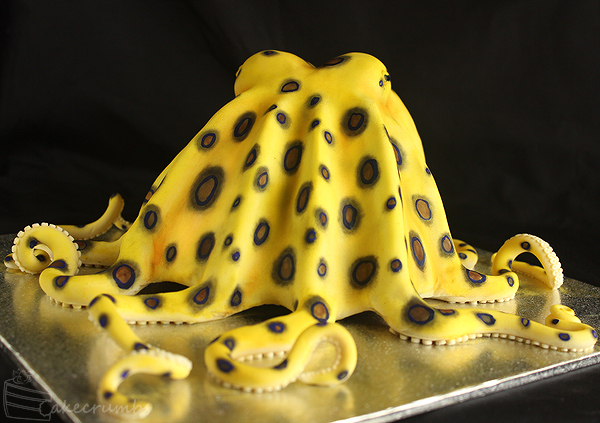 Absolutely LOVE this octopus cake. May I ask what size/shape and how many cakes did you start up with? I’m still not sure I should give it a go, just not sure I have enough skills. Would love to make this amazing cake as well. Would you mind telling me what shape and how many cakes you started out with? Hi, I started out with 4 rectangular cakes. Probably somewhere in the vicinity of 20x30cm. Incredible! I really enjoyed reading about your process and seeing all the pics! It’s beautiful!